Today was a fun day. The family decided that it would be fun to visit the Grand Rapids Children’s Museum. And fun it was. We took two of the four kids, as the older two girls (high school and junior high school age) had other plans. But our youngest two, five and one years old, had a blast. And since we were going to be in Grand Rapids, I paid a visit at a Macintosh Garage Sale hosted by Dan Knight, the publisher of LowEndMac.com. Dan is a great guy. His love for older Mac hardware is honest and contagious. He has been publishing Low End Mac since 1997, which is longer than many of you reading this has been using a computer. Dan has been around during the dark days of being a Mac user, when the computer press (and mainstream press for that matter) was touting the demise of Apple Computer every other Thursday and twice on Sundays. Here is what sets Low End Mac apart from any other Macintosh focused website: they have a wonderful profile section that covers every Macintosh ever sold. Each Mac profile not only gives you much needed information, such as when it first went on sale and reached its end, what hard drive it had, how much memory could be installed, and the like, but also links to outside resources featuring each machine, such as product reviews and commentary pieces. Also helpful is the upgrade path for older Macs, a valuable resource if you are trying to keep an older machine in working order. No, I did not buy an older Mac from Dan. I have enough of those already, and in fact probably need to unload a few soon as well. (Plus, you know, my wife was there and… well, my wife was there! 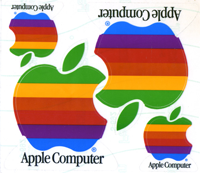 Sigh…) I did purchase something else that I really wanted: the original Apple rainbow logo stickers! Two sets, actually. Once I wash the Honda and the Dodge mini-van, they will be put to good use. There is just something special about the rainbow Apple logo, it has so much more character than the solid color logo Apple now uses. And it is that character that brings me back to Dan and Low End Mac. Looking at my new “old” stickers, I am reminded not of the “bad old days” of Apple or the Macintosh, but of my own memory of discovery in the still-new world of computers and online publishing. When seeing that rainbow logo on another car, it signified, to me, a kinship with another person. A shared passion, a secret brotherhood of interest that most computer users did not share. The same is true of Dan and Low End Mac. We both share a passion for the Macintosh and the community that surrounds it, as well as the both of us being longtime online publishers. Dan, and his passion for older Macintosh hardware and software, is reflected in his online publication, and only reinforced when speaking to him in person. Dan still uses AppleWorks, and his everyday working machine is running Mac OS 9. It’s honoring the past, while still using tools that work just as well as the shinny new ones being sold in the Apple store today. Dan was a pioneer in 1997 when he started Low End Mac, and remains a pioneer to this day, if for no other reason than his continued use of older and much beloved hardware / software. It’s refreshing for me to be able to speak to someone else with a shared history, both in publishing and the Macintosh. It’s even more refreshing for me to see someone like Dan continue on, doing what he loves. Visit LowEndMac.com, take a look around, and revisit the profile page of the first Macintosh you ever owned. I bet it brings back some memories!